Azimian, A., Kazemi, A. (2005). Simulation of a Box Annealing Unit. 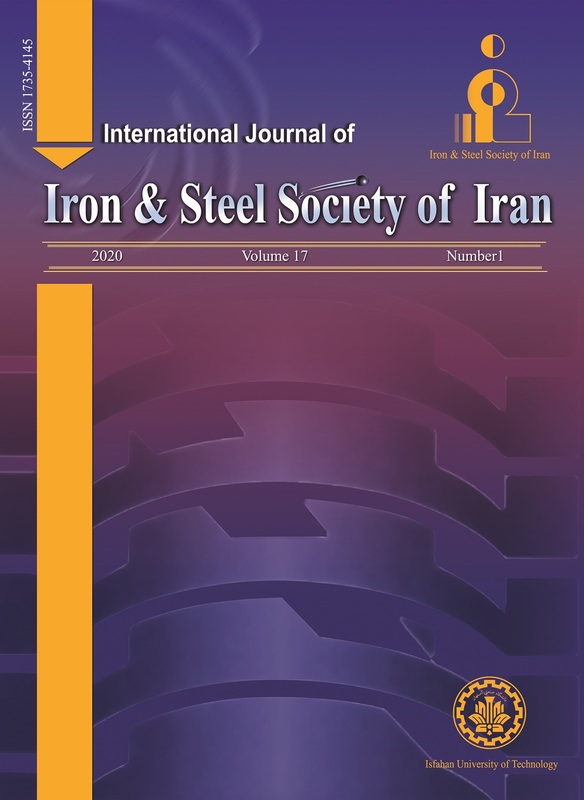 International Journal of Iron & Steel Society of Iran, 2(1), 7-20. A. Azimian; A. R. Kazemi. "Simulation of a Box Annealing Unit". International Journal of Iron & Steel Society of Iran, 2, 1, 2005, 7-20. Azimian, A., Kazemi, A. (2005). 'Simulation of a Box Annealing Unit', International Journal of Iron & Steel Society of Iran, 2(1), pp. 7-20. Azimian, A., Kazemi, A. Simulation of a Box Annealing Unit. International Journal of Iron & Steel Society of Iran, 2005; 2(1): 7-20. In this paper the heating process in a box annealing unit is simulated and the effect of various parameters involved in the process is examined. For this purpose, the full Naiver-Stokes equations along with the standard k- turbulence model are solved in the fluid region using the finite volume approach. In the solid area the conduction heat transfer equation is employed using approporate surface conductance models. The program used for these calculations was the well known fluent code. The effect of various parameters such as inlet temperature, type of gas used, fan power and coil size and weight are examined. Using the simulation results, it is possible to examine the time variation of the temperature at the critical points, i.e. the temperature at the cold and hot spots. Comparisons of the predicted results with the existing field measurement results were promising. Meyer, U. Woelk, C. Arch. Eisenhuttenwes, 45 (1974), 207. Zecca, A.R., Iron and Steel Engineer, (1977), 57. Rovito, A.J., Iron and Steel Engineer, (1989), 35. Rovito, A.J., Iron and Steel Engineer, (1991), 31. Thekdi, A.C., Warme, J.L., Iron and steel Engineer, (1994), 27. Park,S.J., Homg, B.H., Baik.S.C. and Hwon OH.K., ISIJ Int., 38 (1998), 1262. Harvey, C.F, J. of the Australian Institute of Metals, 22 (1977), 38. Junius, H.T, Iron and Steel Engineer, (1989), 45. Brunzel, Y.M; Fomin ,I.M. and Pomerants D.M. Steel in Translation, 22 (1992), 296. Enghofer, R.A, Iron and Steel Engineer, (1990), 25. Powell, D., Iron And Steel Engineer (1988), 43. Scheuermann, W, Boing, D, MPT Int., 18 (1995), 90. Brown, C.T., Hoehner, F., Iron and Steel Engineer, (1989), 61. Johnson, D.W., Parker, H.E, AISE Steel Tech., (2002), 52. Incropera, F.P., DeWitt, D.P., Introduction to Heat Transfer, John Wiley,New YorkUSA, (1995). Sridhar, M.R., Yovanovich, M.M., J. of Thermophysic and Heat Transfer, 8 (1994), 640. Mobarakeh Steel Compound, Personel Training Office, (1991).